1. 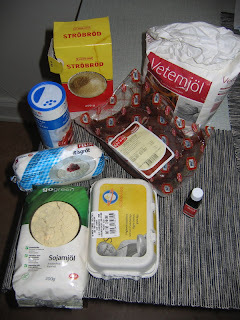 Ingredients; Eggs, Breadcrumbs, Soya Flour, Plain Flour, Fresh Calf Liver, Red Food Dye, Semolina and Sugar. Crushed Dried Cat Pellets were also added though not photographed. The Calf Liver may seem suprising but Carp and in particular Tench are well known to be hugely attracted to Oxblood and Liver. 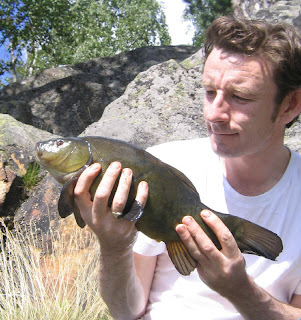 Oxblood is regarded as the top Tench attractant when added to ground bait. 2. 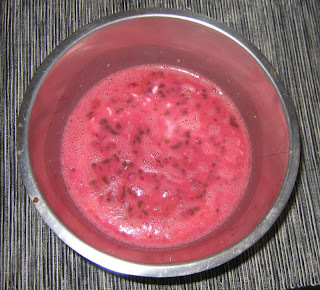 Wet Mix; I beat the five eggs first with the sugar, then added the partially liquidised liver, semolina and a few drops of red food colouring. 3. Dry Mix; Next, in a seperate bowl, I mixed the Plain and Soya Flour, before adding the breadcrumbs and crushed dry cat food. 4. 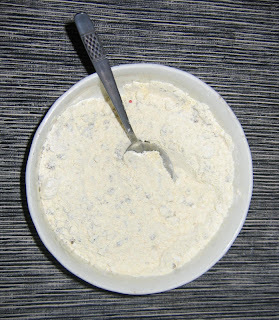 Forming the Dough; The dry mix is added to the wet mix gradually a couple of table spoons at a time. 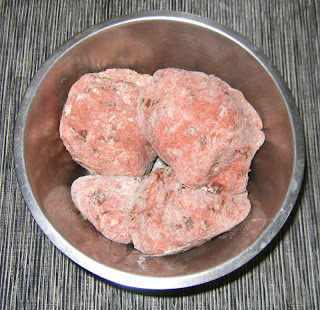 I found as more dry mix was added it became hard work the mixture as it becomes very heavy and rather sticky. Good idea to do this when your girlfriend is far away from home as it is really messy and the kitchen was in bits in no time, not to mention me being covered in flour from head to toe! I had to make up more dry mix as I did not have enough to get the dough to a dry consistence where it could be kneaded easily. A lot of thorough mixing was needed but in the end a really nice dough did result. 5. Rolling the Boilies; Found the best way by far to do this was to roll the dough into long sausages and cut them with scissors before rolling them individually. 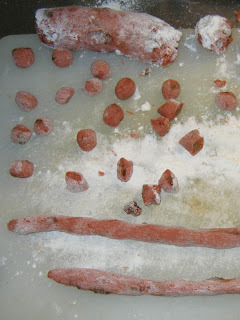 Rolled the sausages into different diameters to get various sizes of boilie. 6. 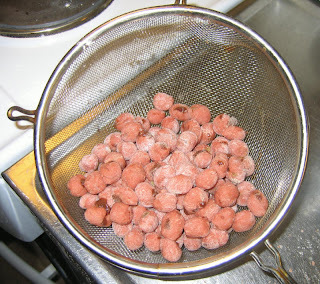 Preboiled Boilies; At this point transfered them to a sieve. Quickly became apparent that too many together would result in them sticking together, so boiled about 25 at a time. 7. 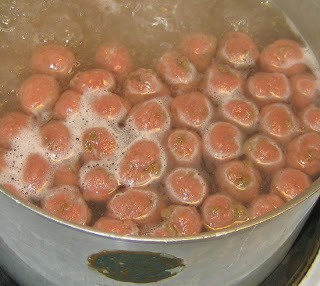 Boiling; Really simple, just threw them into a pot of boiling water for about two minutes. They sink at first but pop to the top after 90 seconds or so and I removed them with a ladle and strained them over the pot with the sieve. The egg in the mix comes into its own here and seals the boiles in a thin skin. The longer they are left in the tougher they become. 8. Drying; After draining them, the boilies are placed on towel of news paper and left to dry out on a level surface over night. This is how they looked a day later. All in all it took me about two hours for the whole process, which was really fairly simple. 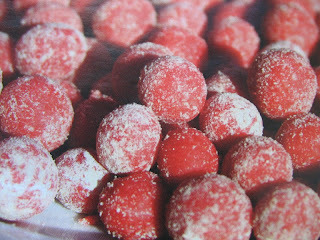 There is no real limit to the flavours and experiments you could carry out making these baits. Pike will be moving into deeper water now that the summer is moving on and it is a great time to catch the larger fish with lures. 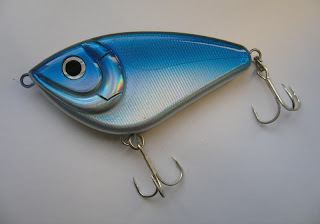 Over the last few years bigger lures and jerk baits have been developed and are now accounting for a lot of really big fish upwards from 20lbs. 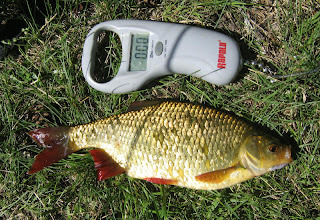 A few lures in particular are catching a lot of these bigger fish and some of the top ones are those above. All these lures are available in different sizes and finishes, though for Pike larger sizes are recomended for the bigger fish. They are expensive unfortunatly, so are best used in deep water in conjuction with strong line and sturdy tackle. Salmo Skinner is a fairly shallow diving lure with a really strong side to side wobbling action and is a devastating lure. It is known to draw pike up from very deep water. It is hard work to fish with as the action puts a lot of strain on the rod tip due to the strong action of the lure. Salmo Slider is a top Pike jerk bait. The rod is pointed down on the retrieve and is constantly twitched back. 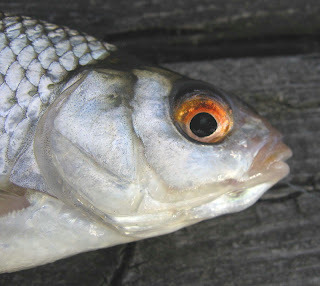 The lure reacts by darting to one side and rolling slightly off balance, only to dart immediatly to the other side on the next twitch and flashing its belly again. This simulates an injured fish and has devastating catching rates for pike. As with most of these lures there is an internal rattle to help attract fish. 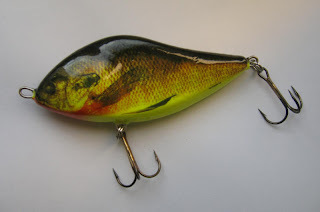 This lure comes in floating and sinking models, with sinking being the most useful as it can fish at any depth depending on how deep it is allowed to sink before the retrieve. 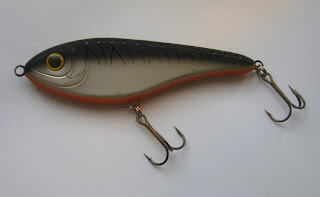 Salmo Fatso is another jerkbait and is usually fished in the same way as the Salmo Slider. It can also be straight retrieved and is a very good caster. 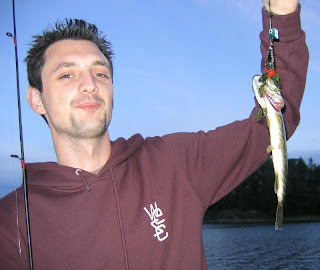 It flashes and wobbles and moves to the sides and is widely regarded as one of the top Pike lures. Very popular at the moment and not always available as it is being snapped up in the shops very quickly. 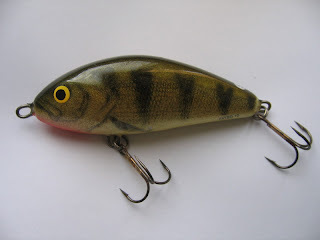 Belly Buster is another jerk bait, is hugely popular and is catching a lot of big pike. 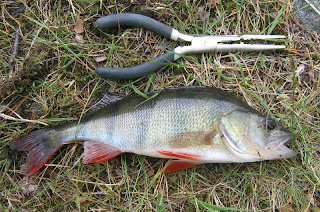 Another lure that simulates an injured fish and is retrieved with sharp twitches and short bursts of reeling. 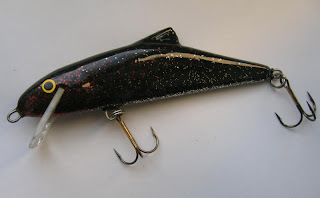 Buster Jerk is the top lure by far for the last few years. 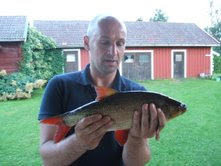 It was found in a survey last year by a top fishing magazine that over 75% of 2olb plus lure caught Pike in Sweden last year were taken on this bait. The very high percentage may reflect the lures popularity here slightly, but there is no doubting is effectiveness nonetheless. 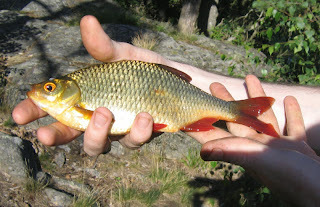 It is a large bait and hard work to fish with due to that but is devastatingly effective for big fish. Quite a lot of fish caught in July, proved a great month to be out. 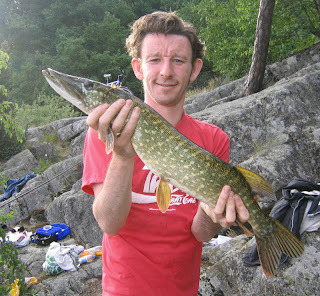 Kevin had a jack Pike at Drevviken, Ian also had a jack Pike at the same site. 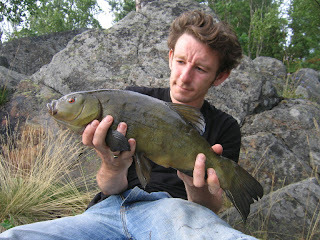 Rafal had his huge Roach and I had several fish, a pair of Tench, several Rudd and a Pike. Worth noting that several species have yet to be caught at all such as Zander, Eel, Crucian Carp, Flounder, Rainbow Trout, Brown trout, Seatrout, Salmon, Chub and Grayling among others. 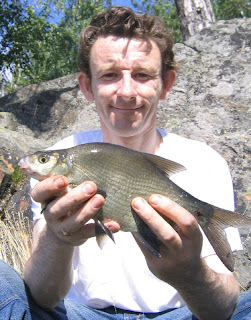 Others such as Perch, Bream and Silver Bream have not been caught at any really good weights and are still wide open for end of the year bonus points. If anyone has other fish to be added that I do not know about let me know and I will take them into account. 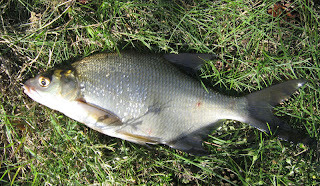 Arived at the lake at 16.40 and immediatly found Rudd feeding heavily. Had groundbaited with pellets first thing and as soon as the worm baited leger hit the water it was taken. 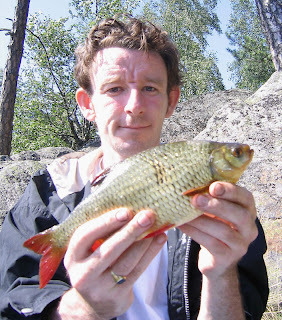 The second fish, also a Rudd, weighed in at .41kilo(14.5oz.) and gave me 1 point. 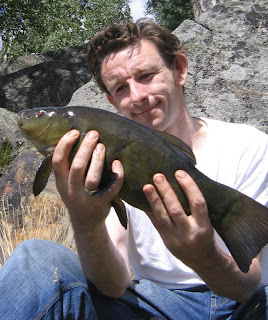 Things remained hectic until 17.45 when a twitchy bite led to a powerhouse struggle as I battled with a terrific Tench that was clearly bigger than the last one I caught here. Eventually the fish came to hand and the scales tipped at 1.91kilo(4lb 3oz.) and gave me 5 points on the table. 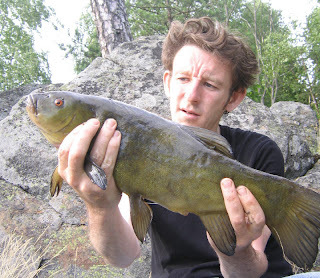 To be honest I thought it might go heavier, but was delighted with the fish. Things went fairly quiet after that with ocassional flurries of activity with Perch, Bream and more Rudd taken. Another Tench rolled on the surface several times but did not fall to my rods before I left at 22.30. A very poor evenings fishing today. Karl, Ian, Rafa and myself struggled to catch. Only one half decent Rudd of .23 kilo on the worm, which was very poor. A 1.96kilo(4lb 5oz.) Pike saved the day somewhat on a float paternastered rudd bait. Ian the chipped in with perheps the smalest Pike ever seen on a spinner! A point each nevertheless! 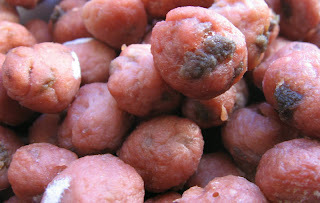 One of many recipes to make your own boilie baits, which are expensive to buy ready made. Better fun to catch on your own anyhow. You can experiment with all kinds of flavourings like Vanilla, Strawberry, Curry or whatever. Also might be worth adding Sweetcorn Oil. 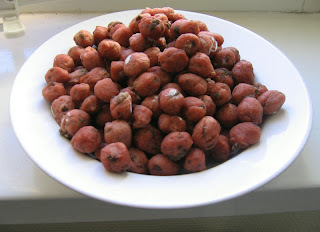 Great baits for Carp and Tench. 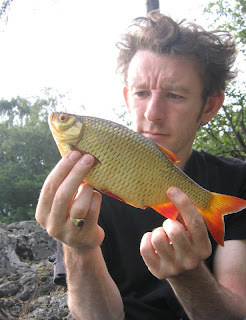 In smaller size could be super for big Rudd, Roach, Chub, Bream etc. Went out to Långsjön for a few hours to check it out. The wind was extremely strong today and made fishing extremely hard and at times almost impossible as it gusted. However, the lake is very much worth a second look as it contains Tench, Carp and Crucian Carp as well as Zander, Pike, Perch and Roach. No sign of any feeding fish today though the habitat seems good in places. Not overly deep at about 6 feet around the margins. 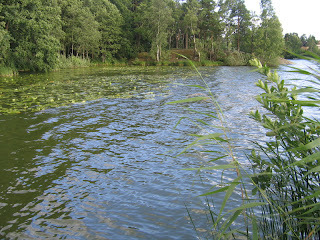 The water is coloured and seems rich with life. 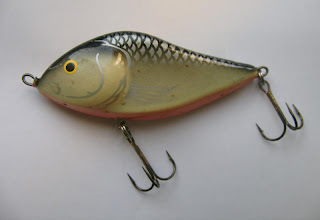 Expect that biggish baits will be required to help catch Carp and Tench, not that they wont take the smaller baits, but to avoid the nuisance of the numerous Roach in the lake. Despite very tough conditions still caught plenty of small Roach on sweetcorn. 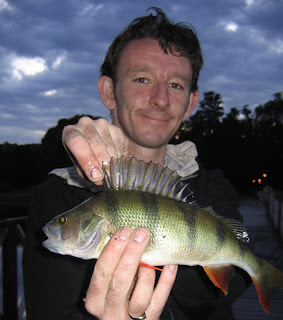 Switching to worm brought Perch to half a pound or so. No points scored but enjoyable all the same. 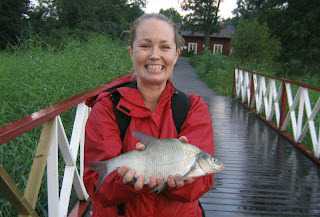 Linda had a nice Rudd not far off the required weight, also had a Perch of about .75lb as well as some Roach and Loi. 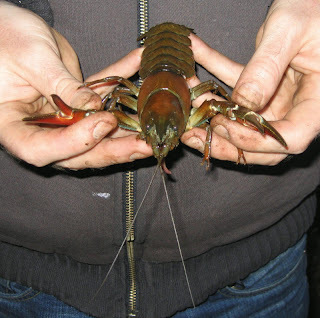 As darkness fell constant twitchy bites had us driven crazy before we realized the culprits were not fish as such but Crayfish. 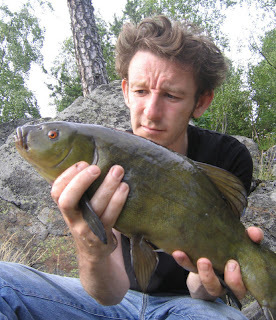 Seems to be a huge population of them here at the moment and it is practically impossible to bottom fish after dusk with worm or meat baits after dusk begins to fall. 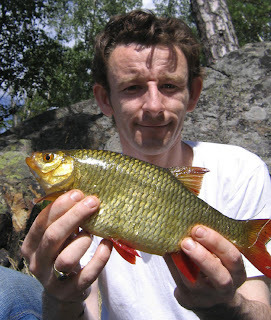 Other news today came by mobile text from Rafal in Dalarna where he took a monster Roach tonight of 2.5lb on sweetcorn oil flavoured boilie. A superb fish which will give him 12 points straight up and must be almost a certainty to be the biggest Roach of the season. 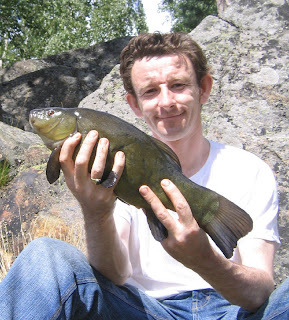 Crucians dont grow huge but are a challenge to catch, apparently they are great fighters too. 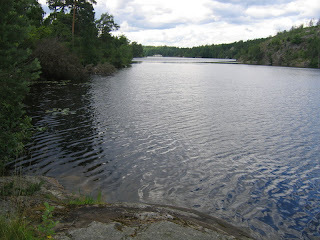 There are a few lakes in Huddinge where they are present and may be worth paying them some attention over the next 8 weeks as they are a summer species only. 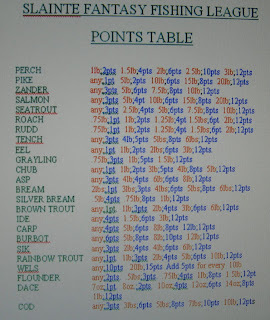 Rules are now simplified, you catch a fish you get points according to the table above. The heaviest 20 individuals of each species caught by each person are counted. The heaviest specimen of each species caught will be awarded 12 bonus points at the end of the calender year. There are lots of species that have not been caught by anyone, so it is well worth seeking out these species with regard to points. Also the heaviest fish of the year of any species will be awarded an additional 12 points. This means that the a pike 0f 25lb, if it was to be the biggest fish of the year would net its captor a whopping 36 points, in other words this league is wide open!